Various front page article headings from the Chicago Defender in March of 1965. 50 years ago this month, Dr. King called hundreds of people to join him in a march from Selma, Alabama to the state’s capital in Montgomery to protest voter registration. The protestors were to gather in the small community of Selma and take the 50 mile trek to address the current governor, George Wallace, and demand change. According to The Chicago Defender and as one would expect, the march was greeted with opposition. On the day of the march in 1965, there was a “tenseness” that covered the town of Selma. City officials contacted citizens urging them to “stay away from the demonstrations” and Gov. Wallace issued an order that said the march was prohibited and that state troopers were to use “all force necessary” to stop the procession.1 You could say things were not going well… The march was attacked with force and people were beaten and tear-gassed in the streets for fighting for their own rights. This protest rocked the country and today serves as a key point in the civil rights movement. The effects of this march even hit close to home. James Reeb, a white man of the church and St. Olaf graduate, died in this fight for freedom on March 11, 1965, 50 years ago from this Wednesday who is being memorialized this week on campus. Why do we memorialize people and events? Well one reason would be to remember what occurred and how it has shaped the way we live today. Maybe a better question is HOW do we memorialize the events of the Selma march. Photographs and statues, plaques and books, all are great options, but what about memorializing through song? 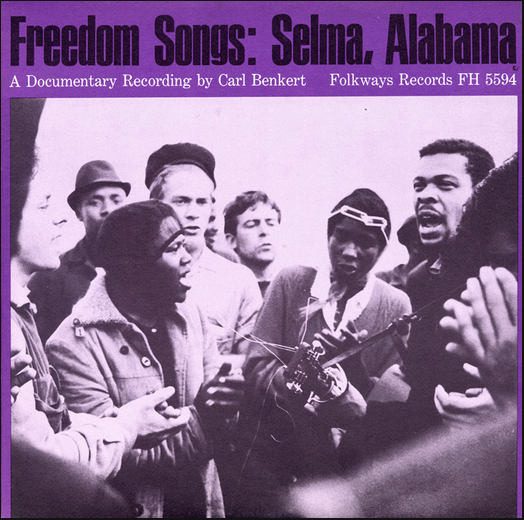 The Smithsonian has a unique collection of recordings in their Smithsonian Folkways collection called “Freedom Songs: Selma, Alabama” which capture the emotional content of the march. Referred to as a “Documentary Recording,” Carl Benkert set out to preserve this moment in our nation’s history through sound. The liner notes confirm that “through all the events of those days, music was an essential element” and that the music expressed “hope and sorrow” while being able to “excite and pacify.”2 One a article even specifically states that the police arrested “hymn-singing Negroes.”sup>3 Songs such as “Nobody Knows the Trouble I’ve Seen” and “We Shall Over Come” were lead by march leaders to establish a sense of unity among the protestors and calm the participants as the marched along their path. For the full list of recordings and to listen to excerpts of these march songs, check out the Smithsonian Folkways webpage. 1 Leon, Daniel. “Prepare for Today’s Big March in Selma.” Chicago Daily Defender (Daily Edition) (1960-1973), Mar 09, 1965. http://search.proquest.com/docview/494135915?accountid=351. 2 Carl Benkert. Freedom Songs: Selma, Alabama. © 1965, 12004 Smithsonian Folkways Recordings / 1965 Folkways Records. FH 5594. Compact disc. 3 Lynch, John. “Arrest 218 in Selma; Protest to Continue.” Chicago Daily Defender (Daily Edition) (1960-1973), Jan 21, 1965. http://search.proquest.com/docview/494121982?accountid=351. This entry was posted in Brandon Cash and tagged George Wallace, James Reeb, king, Martin Luther King, Montgomery, selma, St. Olaf College by Brandon Cash. Bookmark the permalink. I think singing songs/spirituals of the slaves was also a move of the protestors to reclaim those songs, claiming some of the same experiences of oppression and making a statement about whose music it is and who has the responsibility/right to perform it. This is the view of Langston Hughes anyway, writing in the Chicago Defender around that time. Awesome post, B. I love the question, “Why do we memorialize?” In fact, it’s not just a rhetorical question: we memorialize to access the past, but we also do it to say something about our priorities in the present and to set a precedent for future behavior. 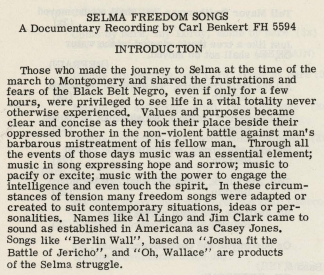 Your discussion of the music at Selma (which you could link to, since we have access to the Folkways album through the American Song database: http://ezproxy.stolaf.edu/login?url=https://search.alexanderstreet.com/amso/view/work/72058) reminds us that music has a role to play in social movements even today. When St. Olaf students next decide to protest – and there will always be protests – what will they choose to sing, and why? Who will record it, and who will explain its significance?